Asma Gul, 35, lives in Kabul with her four children. Kabul — I am uneducated because of my family’s economic problems. I have four sisters and four brothers. My father did not allow me or my sisters to go to school. He always tried his best for my brothers and they went to school with luxurious clothing and book bags and every day he would talk with them about their education. But he never talked with me and my sisters. We suffered, but we were quiet. My father answered by saying, “You are females and tomorrow you will get married and go to another house, but your brothers will continue my generation. They are my partners and it is my duty to spend money on their education today and tomorrow they will support me. If I spend money on your education, who will benefit? Another person will marry you and he will take your salary and get the benefit of your work and knowledge. Hearing this, we all became very sad. We were just children. We wanted to think that our father loves us and kisses us. But he never did. This was an impossible dream for us to have. That is a very bad kind of violence against Afghan girls and I am sure it is an accepted culture in most families. They love their sons more than their daughters. When I reached seventeen my father engaged me with a person whom I had never even seen, without asking me. I married, not with love, but with hate. I hated my father and my husband at the time. I hated all men because of my father’s violence against me. After my wedding I told my father I would never forgive him. I said, “You destroyed my life once when you did not let me to go to school and then you married me with a person whom I don’t love and he is also uneducated.” My father became angry and said he did everything for my future. I never saw a bright and good future for myself. I broke off relations with my family, especially with my brothers, because I thought they were against me. When parents create discrimination among their children, the children will hate each other. This is a kind of parental violence. I am happy that now Afghan women can become educated and defend their rights. This story is so sad and one that has happened often in Afghanistan and around the world. 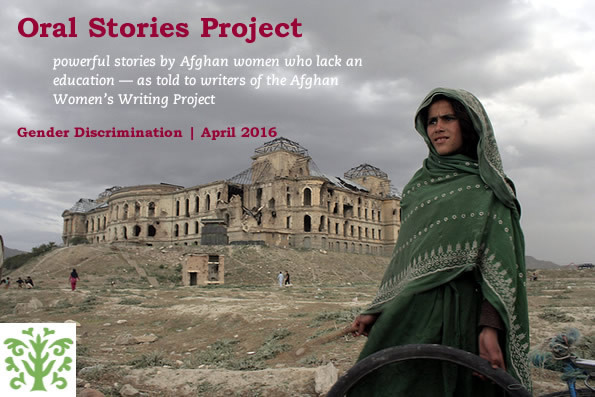 I’m glad to hear that you are finding happiness in knowing that Afghan women are gaining more rights now, Asma Gul, and I hope telling your story has helped you in some small way. I hope too, that you will find a brighter future. Dear Manizha jan thank you for sharing of this, as we (Afghan women) know this is not just story of Asma Gul. There are lots of Asmal Gul with familiar situations and worst than her.